Growing up as a child in the Kidd family would have involved spending most of the time around the houses and away from the main part of the farm. Children in those days were not to be seen, let alone heard. One elderly member of the Kidd family in the late 1970s, early 1980s remembers visiting his grandmother in the Barracks. He was not allowed to be seen on the property so he had to hide inside the Barracks and only come out surreptitiously, so as not to be seen by the Reynolds. 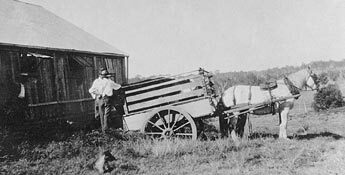 Above: Loading a stud animal from the Tocal bull barn for transporting to a show. Below: The Barracks at Tocal in the years it served as living quarters for single working men. The Kidds were quite retiring and kept their distance from the main house. Some say they never ever ventured onto the front lawn of the Homestead, despite living there for generations. The women working in the house obviously did so, to undertake their domestic duties. Such were the class divisions on 19th century Australian pastoral properties. The Kidds became interwoven with the Clements, Kahler and Meehan families, some of whom lived in the Webbers Creek area, so there was a small cluster of families associated with Tocal and the Webbers Creek community. There would have been a definite path worn between the various houses which, in the times of floods or wet years, would be hard to access. Above: L-R William Kidd, Darcie Reynolds, John Kidd (and unknown) at Tocal. Note the convict bell at the top of the stone barn.